Photograph of Nottingham Day Nursery in the 1930s. Image courtesy of Nottinghamshire Archives (ref: DD/1516/1). At the end of the nineteenth century the main employment for working-class women in Nottingham was in the lace trade, lace finishing. Many of these women would have been mothers, their wages would have either supplemented their husband’s wages or were their only income and in the absence of any social influences to alleviate poverty and improve housing conditions it was necessary for them to work either at home or in a factory. At the time motherhood was considered the most important role for a woman; mothers were seen as a major influence on the survival of their child. One of the most influential factors on infant deaths, according to contemporaries was the mother; she was blamed for going out to work, leaving the child with unsuitable child minders, failing to provide a home life suitable for a young child, for not suckling her baby and for not providing decent living conditions for the child to grow. In 1875 there was a growing philanthropic spirit in Nottingham; firstly the Town and County Social Guild was formed and from this organisation the Nottingham Society for Organising Charity became active in the town. This spirit was further expressed when a Day Nursey was founded in Nottingham at 2 High Pavement (now the site of the Contemporary Arts) in June 1875 by Catherine Bayley of Lenton Abbey (a house known as Lenton Abbey which is now in the University of Nottingham grounds). 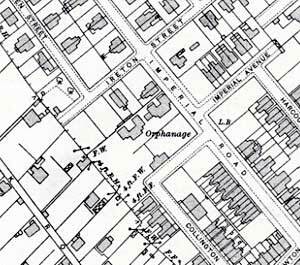 By 1877 the Nursery had expanded and through necessity an Orphanage had been opened and the two combined institutions initially shared premises at High Pavement but from 1881 on Heathcote Street. These were well placed in the town centre because it was easily accessible for those mothers who were compelled to leave their homes to work. Both Catherine and her brother Thomas Bayley were council members of the Town and Social Guild. So it was natural that the Social Guild was interested in how the Nursery progressed. 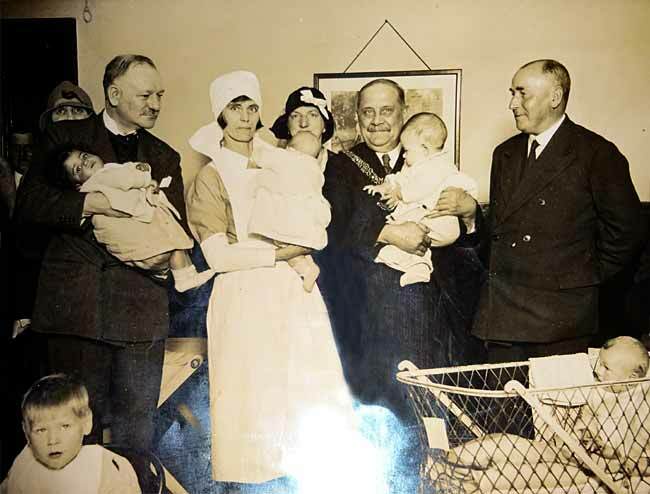 At the first AGM of the Nursery the Social Guild asked for a report but were informed that as the Nursery had been incorporated with the Orphanage and the objects of the institution had widened the Nursery Committee did not wish to continue its connection with the Social Guild. A further communication in May 1880 stated that the Social Guild did not think that there would be any cross over of work between the two Committees in relation to the opening of creches. Nevertheless, the connection between the Nursey and the Town Guild remained when they were asked to attend a Nottingham Society for Organising Charity conference in 1910. Miss Bayley was well connected, being the daughter of Thomas Bayley, a leather manufacturer, colliery owner and one of the founders of the Nottingham Co-op. Her brother, also called Thomas, was a member of the Town Council and later an MP. Their money came from the colliery, ‘The New London’ at Newthorpe, Nottinghamshire. She wrote to the Nottingham Guardian in 1877, asking for donations towards the upkeep of the Nursery and Orphanage. In the letter she states that the sort of children entering the Orphanage would be orphans as well as children whose parent was a widow or widower or whose parents were too sick to look after them. Both institutions were to be run on a strictly unsectarian basis. At the first meeting of the Committee members included, Catherine, her brother, Thomas, Jesse Hind, solicitor and JP of both City and County, Mrs S G Johnson, wife of the Town Clerk, Mrs Edgar B Truman, wife of the late analyst for the borough of Nottingham. The meeting provided the structure of the organisation and who was to do what. A ladies committee was set up to meet weekly and manage the Nursery; the secretary was to prepare application forms for admission to both institutions. Miss Bayley and the secretary were to draw up a circular to explain the objects and working of the institution. In May 1878 the secretary wrote to the Local Government Board, London to enquire whether the Orphanage could be certified as a school and if so what power would the Inspectors have on the Nottingham Orphanage. In the June of that year they received confirmation that they had received Certified School status. This meant that they could receive payment from the local Board of Guardians for some pauper children boarded out in the Orphanage. This was an interesting departure for the Poor Law Guardians who saw the workhouse as the focus for the poor. At the AGM of 1880, Councillor Acton, Chairman of the Orphanage Committee, stated that as a Poor Law Guardian he could say that the influence surrounding the workhouse life had serious and evil effects upon the minds of young children and one which calculated to do them great injury in their later life. 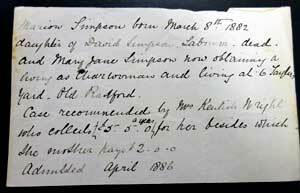 Notice regarding Marion Simpson, 1888. Image courtesy of Nottinghamshire Archives (ref: DD/1101/5/1). The funding for the Day Nursery and Orphanage came from different sources. Parents who were able to contribute money for their children paid between 2/- and 7/- a month. An example of this is Jane Wilkinson who was taken in after the death of her mother; her father was in the army and it was arranged that 7/- would be deducted from his army pay to go to the Orphanage. The Board of Guardians would pay 3/- a week per child. Donations from individuals and organisations were also sought. Another example is that of Marion Simpson: her father was dead and her mother worked as a char woman. She was admitted in April 1886. Her case was recommended by Mrs Kentish Wright, wife of the Chairman of the Nottingham Society for Organising Charity, who collected £5.5.0 a year for her upkeep but when her mother could afford it she would pay £2.0.0 a year. Members of the Committee would collect subscriptions and there were fund raising events held regularly. One of the largest was a Bazaar held over three days in November 1878 at the Albert Hall in Nottingham. It raised over £1,200 of which £1,000 was to go towards building an Orphanage out of town. At the AGM in 1880 there were 20 children between the ages of 2 months and six years on the Day Nursery register and was believed to be one of the first creches in the country. There were 26 children between the ages of 6 and 12 years in the Orphanage. The tenancy of the property on High Pavement was shortly to expire and it was hoped that to find a suitable premises in the town that would be convenient for the Day Nursery. At the same time Miss Bayley was looking outside of Nottingham for a property to transfer the Orphanage. She wanted children to live in a healthy environment with space to play in fresh air. She thought that there should be no more than twelve children in each cottage so that it felt more like a family rather than an institution. A piece of land had been purchased in Beeston in a suitable location and two cottages were being erected which would be able to accommodate 24 children. She had agreed to undertake the expenses of one of the homes and pay for the furniture and it was agreed that she would be the Superintendent of the homes with two matrons but under the supervision of the ladies committee. A home was opened in Beeston in August 1880 on Broughton Road, Beeston (now called Imperial Road). The 1881 census gives a detailed list of the staff and children in the two cottages. In cottage two, brothers James and Louis Stevenson were given work at a lace manufacturers and in the leather industry. The mother of John and James Snowden had died in 1876 and they were admitted to the Orphanage but by 1878 no payment had been received for the two boys and their father could not be traced and the Guardians of the Poor Law were asked to pay for them. Miss Bayley, however, later undertook to pay for James. By 1885 more room was needed and plots of land were purchased adjacent to the existing cottages and two new cottages was built for the growing numbers of children. An interest free loan of £1,000 had been arranged to be paid back over a period of five years. The running costs of the orphanage was £1,000 per annum for the 40 children, however this was eased by the fact that clothing was donated and the care and teaching of the children was done by volunteers. Lord and Lady Belper officially opened the new cottages on 3 August 1886 and in his opening speech Lord Belper paid tribute to the liberality of Miss Bayley and her vision in helping such children. He also mentioned the work and goodwill given by volunteers who supported the establishment. The Home accepted girls and boys from Nottingham and the immediate surrounding are, who had lost either one or both parents and occasionally children of sick parents. Admission policy was not for waifs and strays, nor were they training homes for older children. They were, instead for little children, orphans of parents, who had in their lifetime been respectable working people. Over the next few years both the Day Nursery and Orphanage were busy; for several years there were about 40 children in the Nursery and 32 at Beeston, 19 boys and 13 girls. During the period 1885-1887 the town was in a depressed state with little work available and the facilities had been called upon a greater number of times. Mrs Turney the wife of Sir John Turney, who had been President of the trust, gifted the sum of £270. Sir John was very complimentary about the work done by Miss Bayley but suggested she needed to publicise the work undertaken more to increase funds. In September 1899 a deputation from the Basford Guardians visited the homes in Beeston and were so impressed that they agreed to pay 5 guineas annually to the Beeston Orphanage. Over the next decade despite celebrating their 21st anniversary, the Nursery and Orphanage underwent some difficulties. Fewer ladies were visiting the establishments. This gave cause for concern to Catherine, who believed that she as not pleasing the committee, especially over choosing the new matrons without first consulting them. She offered her resignation which was declined and was then given free rein to appoint matrons. Matrons were paid between £21 and £25 per annum. Unfortunately one matron in 1907 began work on Saturday but had left on Thursday giving no reasons. The homes also suffered their share of childhood diseases. In April 1905 there was a severe case of ringworm in the Boy’s home and in July the same year diphtheria was prevalent. In March 1906 Catherine was hit by tragedy when her brother died which had a long lasting effect on her health as in 1908 she told the committee that she could no longer carry out the onerous tasks of supervising the homes. However, once again the committee asked her to continue and do as much as she could. In the 33rd AGM in March 1908 the President congratulated the society on its work, despite the lack of funds, it was one of the small charities of the city but an eminently useful one in both branches. The call for such institutions as day nurseries seemed to be a growing one, especially as the number of women being forced to work was increasing. The same year showed how some of the children in the orphanage were helped or found work. One family was sent back to India where they had family; one girl went to help her mother in the milk shop she ran; one boy was sent to Canada to join his brother; a girl went to join her father in Philadelphia. In 1909 subscriptions to the institutions had fallen off quite dramatically; there is no one reason given for this but during 1905 and 1906 there had been a particularly bad depression in work in the city. Miss Bayley became ill and only agreed to carry on some of her work if her nephew Dennis Bayley agreed to help her. From then onwards she was often indisposed to attend meetings. She died in 1921 and is buried at the General Cemetery in Nottingham. The Orphanage was known as the Children’s Home, Beeston in accordance with a wish to identify more closely with the village of Beeston. The premises were used for a Red Cross hospital and a hospital supply depot during the wars. The Home was closed in 1947 for a variety of reasons including increasing in wages, a lack of voluntary workers and the fact that Homes of this type would soon be coming under government control. It was handed over to the Corporation as a child guidance hostel. The Home no longer exists and in its place the Silverwood Nursing Home for the elderly, was built on the site. Nottinghamshire Archives hold photographs and account books (ref DD/1101) relating to the day nursery and orphanage.